Insider tips and trade secrets from five of the region’s leading landscape architects and designers. 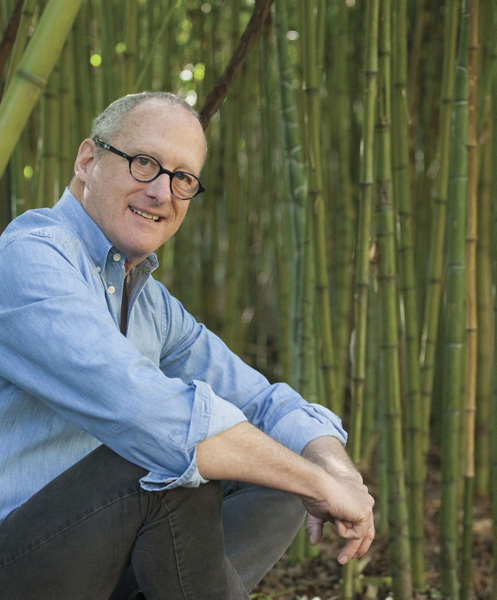 David Gibson was already a licensed landscape architect when he decided to take his traditional education and expertise one step further—at Harvard Graduate School of Design, no less. So expect solid, traditional design and lots of elegant line drawings from this well-pedigreed pro, who started his company 30 years ago after moving back to Sacramento. Just don’t expect him to install it all. Gibson focuses purely on conceptual, aesthetic design and depends on the contractors that his clients vet and select to bring his drawings to life. Gibson loves his job because it brings so many of his passions together: design, earth, people, even a bit of psychotherapy. And no matter whether he’s working on a $25 million estate in Monterey or a tiny, tucked-away yard down the street, he always ensures that he leaves the “head designer” title to the property owners—because they are the ones who will be enjoying the spaces he helps create. WHAT DO HOMEOWNERS WANT THESE DAYS? It used to be that people, especially in Serrano and Granite Bay, had to have everything: outdoor kitchen, fire pits, toys, toys, toys. But I’m seeing a lot more sensitivity to “less is more.” It’s more about richer experiences that aren’t as dependent on stuff but on the overall joy it gives. No matter how much money you have, it all comes down to what’s important to you. There’s also a lot more demand for contemporary and modern design. And obviously with the drought, we are seeing more appropriate plantings and less lawn. EVERY GARDEN SHOULD HAVE . . .
Peace and good energy. If you don’t have a basis of clarity and calmness, you’re just throwing money at “stuff.” A yard should always have a level of tranquility. NO GARDEN SHOULD HAVE . . .
Too much. Restraint is the hardest challenge out of everything I do in design. You know that old adage about getting dressed, then taking one or two pieces off before you leave the house? Same thing with landscape. Editing is hard. But clutter leads to bad energy, which leads to properties being sold and resold. WHAT SHOULD HOMEOWNERS LOOK OUT FOR WHEN SELECTING CONTRACTORS? I consider myself a dinosaur in the industry, but that means I’m older and wiser. I’ve seen all the pitfalls. Low bidders are low bidders for a reason. Some cut corners. If you want the best work, get the best contractor. This means you need to do your homework. The best projects, no matter how many sketches and documents you have, are based on the skill and integrity of the contractors you use. TELL US ABOUT AN INTERESTING PROJECT YOU’RE WORKING ON. I have a client in Grass Valley who serves on the board of The Aldo Leopold Foundation and has a 3-acre sustainable farm on a 300-acre property. It’s exquisite. I’ve assisted on conceptual design for the placement and style of the farm buildings and guesthouse. We’ve brought in sculpture. He’s selected some amazing, site-specific bronzes that pay respects to the Native Americans who once inhabited the area. It’s one of the coolest properties in the region. With a degree in horticulture from Cornell University, Nancy Greenlee began her landscaping career in the late 1970s, working on private estates and botanical gardens in Ohio, Michigan and New York—most notably for David Rockefeller on his estate in Pocantico Hills, N.Y. She also designed and implemented planting plans for the Rockefeller Center Channel Gardens in Manhattan. (Speaking of NYC, Greenlee once paid a house call to John Lennon and Yoko Ono’s Dakota apartment to tend to a sick palm tree.) 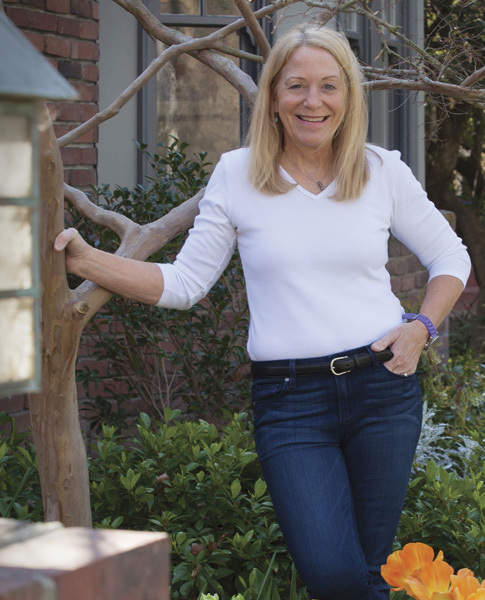 After moving to Sacramento and having two children, she began consulting and reworking neighbors’ and friends’ yards, as well as selling and planting spring bulb plants. Today, her business, From The Ground Up, specializes in adding color to landscapes and helping people enjoy their yards with each changing season. WHAT ARE YOUR FAVORITE PLANTS AND WHY? The first one is sweet peas. I love the fragrance, and they look beautiful freshly cut cascading over a tall vase. My second favorite plant is the tulip. I plant hundreds of them every year in my yard and thousands for my clients. The excitement of watching the bulbs emerge from the ground, grow up and open into vivid, wonderful-colored specimens takes my breath away each spring. I have been nicknamed The Tulip Lady by many people, which is pretty accurate. WHAT’S THE WACKIEST REQUEST YOU’VE EVER GOTTEN? I had a client who had a huge 10-foot shrub in her backyard and wanted me to prune it into the shape of a large heart as a surprise for her husband. The plant was a big pyracantha, which is an evergreen with beautiful red berries but very large thorns. All I can say is it was good I was up to date on my tetanus. I was successful but paid a prickly price. ARE YOU GETTING A LOT OF REQUESTS FOR EDIBLE GARDENS? I have several clients who want to have space for a vegetable garden. I love to use raised beds and containers, as it keeps the growing area cleaner year round. Otherwise, by August the plants can look overgrown and unsightly. Keeping a vegetable garden requires hands-on maintenance and is not covered by weekly gardening crews, so I am always excited when someone wants a space to “garden,” as I know they are truly vested in their yard and will know when there are any problems, like insects, water and weeds. There is also instant gratification in watching your garden grow and, of course, eating what you harvest. My yard is shady, so for the last 10 years, I have rented a garden plot downtown. The garden is totally organic and has been a good learning experience. I grow a cover crop—fava beans, clover, etc.—in the winter and amend the soil with mushroom compost. When pests appear, I handpick them off or destroy affected plant parts. I remove weeds by hand. Sometimes the yields are small or the produce doesn’t look perfect, but I know what I eat is safe. Soon after receiving a degree in theater from UCLA, Gary Kernick realized that acting wasn’t his path. 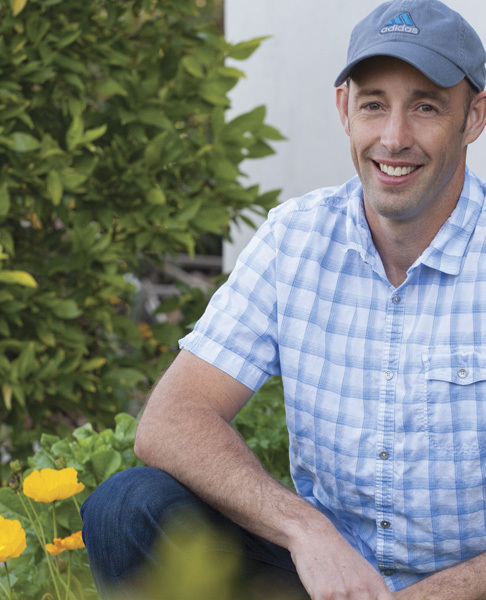 So he tapped into his love of the outdoors and pursued landscape design and contracting. He ultimately moved to Sacramento and started Change of Seasons. Kernick’s approach to landscape design: He first creates a hardscape plan and installs it. Then he takes his clients on a nursery tour to see what they like. Next, he creates a “plant palette” and fills in the open spaces based on the clients’ preferences and his expertise. WHAT’S THE BIGGEST MISTAKE HOMEOWNERS MAKE? Some homeowners can be shortsighted in terms of the benefit of having a really well-designed front and backyard. They don’t think about how, if they chewed off just a little more, they could add a lot of value to their homes. Like lighting. I try to include lighting on all my projects. It increases the functionality of the space and the safety of using it. Plus, when you’re looking out your windows, lights have the effect of extending your home space all year long. IS THE “OUTDOOR ROOM” CONCEPT STILL BIG? I think it is. In fact, it’s expanding. People are even thinking about living spaces in the front yard, now that they are removing or reducing their lawns. WHEN MONEY IS NO OBJECT, WHAT ARE SOME FAVORITE DESIGN ELEMENTS? One of my go-tos is doing a unique custom water feature. I recently designed one out of 12 large steel pipes and made a pipe organlike feature. There are also water walls and boulder fountains. Fire bowls and pits are becoming more popular than outdoor fireplaces, because people want to all sit around the fire. You can do upgraded paving materials like stone, slate or brick, which are more expensive than concrete. And go for larger plants and trees. I like to get big 24-inch boxed trees, because they make an immediate impact and provide instant privacy. A former art teacher and artist, Roberta Walker traded in her paints for plants 18 years ago after helping out at a friend’s nursery and becoming fascinated with all things flora. As such, her landscapes are artistic and beautiful. They’re also largely drought friendly. Sunset Magazine captured her knack for a water-wise gardens in 2009, when it featured Walker’s own yard, a quarter acre in the Arden Arcade area that functions solely on a drip system. 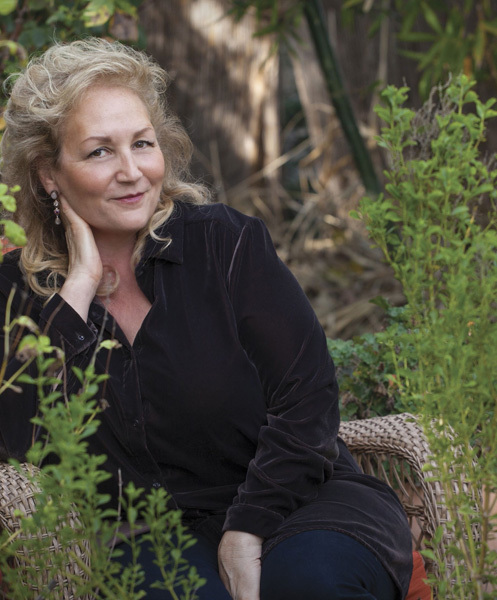 Having designed more than 1,000 landscapes in the region, the principal of Roberta Walker Landscape Design is known for creating a full, rich look that suits what her clients want and what the landscape allows-with lots of color throughout every season. 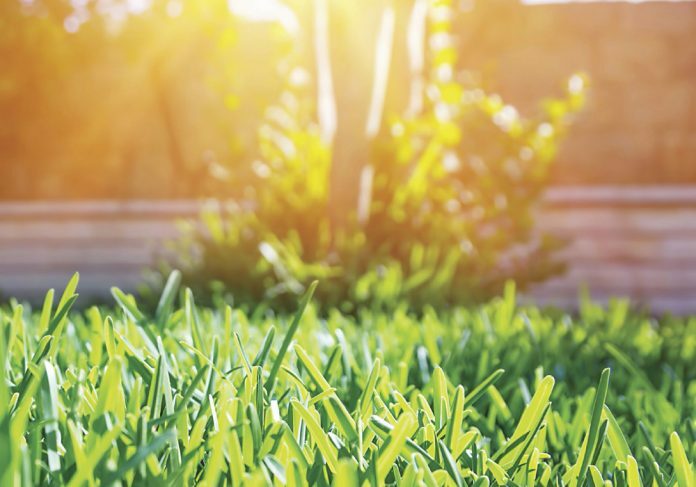 IS THE LAWN DEAD FOR GOOD IN CALIFORNIA? I hope so. California, unfortunately, has not been good about conserving. There are literally millions and millions of acres of lawn consuming millions and millions of gallons of water. We also have a Mediterranean climate with no rain in the summer, so lawns do not belong here. You don’t see them in New Mexico or Arizona. There are so many more beautiful ways to go. And as the capital city, I think Sacramento should be a model for using plants that fit our region and climate. HOW HAS THE DROUGHT AFFECTED WHAT YOU DO AND WHAT CLIENTS WANT? I’ve been busier than ever. I’ve been pulling out lawns for years. But before the drought, it wasn’t about water; it was about mowing. Now, it’s about water conservation, and everyone who’s coming to me wants a water-wise design. When I do work with lawn, I use a blend that takes 50 percent less water, so you can have your cake and eat it, too. WHAT ARE SOME COOL GARDEN RESOURCES YOU CAN RECOMMEND? Peaceful Valley’s website, groworganic.com, is a great resource for all types of gardens. Locally, Green Acres is an all-star. They revolutionized the nurseries out here by really educating people. You can’t get that at Lowe’s or Home Depot. High Hand Nursery is beautiful, too. Panama Pottery is a quirky little place where I get hard-to-find, unique stuff at great prices. And because mulching is key for drought landscaping, I go to Carol Jones, who I call Carol the Compost Lady. I give her number out all the time: (916) 397-2854. OFFER SOME ADVICE ANY HOMEOWNER COULD USE. Most people are either letting their lawn die, thinking about letting their lawn die, or have already ripped it out. Before you do anything, create a plan. A design. You can’t just take out a lawn and start dotting plants everywhere. It would be a mess. Keep flow in mind. For example, I’d say 90 percent of homes have a driveway with a pathway at the top leading to the front door. Keep that flow in mind when planning out additional pathways or mounds. Having a plan before doing anything else will also help you better calculate all the materials you’ll need. WHAT ARE SOME SACRAMENTO-FRIENDLY PLANTS? Rosemary, lavender, salvias, yarrow, pittosporum, lantana, black-eyed Susans, Kniphofia (also known as red hot poker flowers), dwarf agaves and a lot of ornamental grasses. Junipers have a bad rap. But when done correctly, they are great. Chris Corbett has a bachelor’s in landscape architecture from UC Davis, a certificate in architectural design from Denmark’s International Study Program, and a master’s in architecture from University of Oregon. 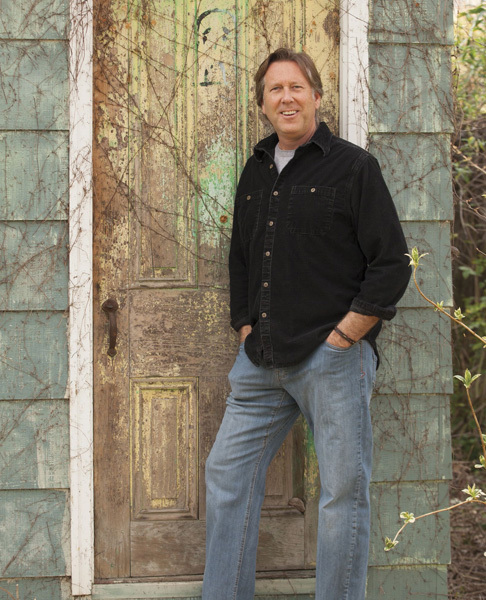 Corbett acts as both designer and contractor for each project, and he oftentimes works alongside a home’s architect to ensure synergy between outdoor and indoor spaces. Located in Davis, Chris Corbett Design provides a single, full-service point of contact for every facet of landscape work: grading, demolition work, masonry, landscape lighting, planting, irrigation—Corbett handles it all. WHAT ARE SOME CURRENT TRENDS IN LANDSCAPING? There’s definitely a push to remove lawns and install more drought-tolerant landscapes. This, in turn, leads to the installation of more low-water-use plants, like native and Mediterranean varietals, succulents and ground covers, and using gravel or hardscape instead of lawn. WHAT ARE SOME CURRENT TRENDS IN HARDSCAPE? I’m seeing a lot of interest in moving away from heavy aggregate finishes on concrete and toward a more subtle sand finish, which is achieved by etching or sandblasting. People are also moving away from brick and going more with stone—like bluestone, because it’s made in the United States, is more affordable and comes in infinite options. It’s a nice stone to work with. WHAT IS YOUR BEST DESIGN TRICK? For front yards, I like to create layers using a subtle elevation change, like a step or a half wall, to break up the yard into smaller spaces like outdoor sitting areas. So when you look at the house, it’s not just lawn all the way up. And it makes things begin to feel more private as you approach the house. I also like to take materials that the architect used on the house and incorporate them into the landscape to create continuity between the house and the landscape. WHAT IS YOUR FAVORITE SUSTAINABLE MATERIAL TO WORK WITH RIGHT NOW? Gravel. People often don’t identify gravel as something that they would want in their yard, but there are many different sizes, textures, colors and shapes that can complement the planting and hardscape elements. It doesn’t take any water, and it’s generally a locally sourced material. WHEN IT COMES TO LANDSCAPE DESIGN, WHAT GIVES YOU THE BEST BANG FOR YOUR BUCK? A thoughtful planting plan can do wonders for a yard. Plants are relatively inexpensive and can act as a screen or define an outdoor room, and they don’t incur the same cost as hardscape. Costwise, three of my favorites are deer grass, Yaku Jima silver grass and Hameln fountain grass, because they fill in so quickly. In one season, you get a phenomenal change in size.